When it comes to cleaning up, convenience is key to keeping you from wasting precious time on dull, but necessary, cleaning tasks. There are many different cleaning products that can reduce your time spend cleaning while still helping ensure that you are able to maintain your preferred level of cleanliness in your home or professional settings. One of the items that can help you maintain a clean space is a commercial backpack vacuum. These units are easy to use and can greatly reduce your vacuuming time. A backpack vacuum can make cleaning up around your home or business easier. You’ll have free range of motion when using the vacuum attachment and don’t have to worry about lugging around a stand-up vacuum unit. Most of these types of vacuums come with a long cord so you can easily move around your space freely. There are several different types of backpack vacuums and they are available in a wide range of prices. The following is a list of the 10 best commercial backpack vacuums. 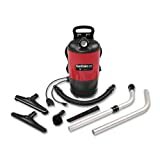 The ProTeam Super Coach Pro 10 QT Vacuum Cleaner comes with the following attachments: multi-surface floor tool, duster brush, crevice tool, upholstery tool, 2 tool extension wands, a heavy duty tool hose, and a 50 foot cord. This versatile tool can be used to clean stairs, floors, furniture, and nearly any other surface in your home or office. This backpack vacuum uses 3 filters to help protect the motor from potentially harmful buildup. It has an updated design that was made to fit comfortably on your back. It can be used in many different commercial businesses and comes with a 5-year limited warranty on the motor. The Makita Brushless Cordless Backpack Vacuum has a powerful motor that creates 53 CFM of suction power. This unit comes with a HEPA filter that helps to remove most dust and allergens to improve air quality. The two-stage filtration system helps to extend the life of the main HEPA filter so you don’t have to change it as frequently. 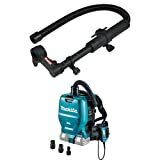 This vacuum from Makita is cordless which allows you to move around easily when cleaning. It has an extended battery life and a larger dirt capacity than many similar vacuums. The unit can be used for up to 90 minutes of continuous usage or 60 minutes on the high setting. 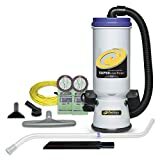 The Powerful Proteam Super Coach Pro Backpack Vacuum Cleaner is similar to the previously mentioned Proteam Super Coach but has different attachments. This option comes with the following: 14″ floor tool, two-piece wand, 17″ crevice tool, 3″ dust brush with reducer, and a 5″ upholstery tool. This backpack vacuum has an ergonomic design for comfort. The new design features a triangular shape and a slim profile that makes this unit is to wear. It has a 4-level HEPA filtration system that works efficiently to remove dust, dirt, and other tiny particles from floors to help improve the air quality. The Sanitaire Quiet Clean Backpack Lightweight Vacuum works well for cleaning hard to reach places. This unit has the CRI seal of approval. The lightweight design allows you to easily move around the home or office space without pain or fatigue from carrying a heavy vacuum. It has a 4-stage filtration system to help remove dirt and allergens. This backpack vacuum from Sanitaire has 5 amperes of power. It comes with various attachments to help you clean stairs, upholstery, and other areas. The included HEPA filter can remove around 99.9% of particles down to 0.3 microns. The Powr-Flite Comfort Pro Premium Backpack Vacuum is a powerful machine that has a 10 quart capacity dirt container. This vacuum is ideal for many commercial uses and could also be used in a home where you need extra cleaning power for large spaces. This vacuum is compact and lighweight but is able to clean around 2.5 times faster than most upright vacuum cleaners. It has a comfortable design with adjustable straps so you can wear the unit without back or neck pain, even when cleaning for extended periods of time. It’s equipped with 5-stage filtration and also includes a HEPA filter. The 2018 Prolux 2.0 Bagless Backpack Vacuum has an innovative design that makes it 40% more efficient than previous models. This unit is also designed to be user-friendly and extremely easy to use around your home or office. It comes with a tool kit that has several attachments and an adjustable wand that works well for cleaning stains, corners, and other tight spaces. This backpack vacuum has a self-cleaning HEPA filter that virtually eliminates clogs in the filtration system. This also helps prevent the vacuum from losing suction over time. The unit is lightweight, weighing only 9 pounds, which makes it easy to maneuver. The Hoover CH3000 PortaPower Lightweight Commercial Canister Vacuum has a built-in blower for versatility when cleaning around your home or business. It can also work well as a car vacuum due to its small size. This unit comes with a reusable commercial cloth bag or a paper option for easy disposal. This vacuum from Hoover has an adjustable shoulder strap so you can wear it across your shoulder for comfort. It’s compact and lightweight so you can take it anywhere you need it. It’s equipped with a long cable and a stretchable hose to help you reach tight areas easily. The GV ProTeam Super CoachVac Commercial Backpack Vacuum Cleaner comes with the GV Pro Kit attachment set. This set includes a durable electric power nozzle/head for quick and thorough cleaning. 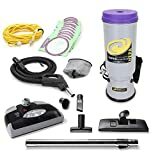 The vacuum has an adjustable length extension wand so you can easily clean stairs, corners, high areas, and other places that are hard to reach. This commercial backpack vacuum from ProTeam has high-output LED lights to help you clean in areas with low light. The unit comes with an upholstery tool, a crevice tool, and a duster brush. It also has a multi-surface floor tool that can clean many different types of flooring. The Hoover Commercial Lightweight Backpack Vacuum has a lightweight design that makes it easy to maneuver around different areas for thorough cleaning. This unit weighs less than 10 pounds and it has a chiropractor-designed harness that helps reduce strain on the back, neck, and shoulders. This backpack vacuum from Hoover has a quiet operation so it doesn’t disturb those around you when you’re cleaning. It has an extra-long quick change power cord so you don’t have to switch outlets as frequently when cleaning large spaces. It also includes an accessory pack with a crevice tool, a turbo floor tool, a dusting brush, and an upholstery tool. The Super CoachVac Commercial Backpack Vacuum Cleaner has a powerful motor that can clean carpet, stairs, hard floors, and upholstery. This vacuum has a large capacity tank so you don’t have to empty it frequently when you’re cleaning. This backpack vacuum from ProTeam has a 4-level advanced filtration system with a HEPA filter to remove allergens and other particles for better air quality. It’s designed to operate quietly so you can use it without causing noise disruption. It works well for high traffic areas like schools, restaurants, hotels, and other places where you need a lot of cleaning power. A backpack vacuum can be an excellent investment for those who find themselves cleaning large floor spaces frequently. Many of these vacuums are designed to clean carpet as well as hard flooring. They can easily switch between the two types of flooring by simply switching the suction settings. Most are relatively lightweight and can be worn easily without causing pain the back and shoulders. Using this type of vacuum helps free up your hands and makes cleaning hard to reach places easier. When you’re shopping for a backpack vacuum you may want to consider the capacity of the waste tank. Some are larger than others and are designed to clean large areas without needing to be emptied frequently. If you have a smaller space to clean you would likely prefer a smaller unit as they tend to be more lightweight and easier to use. You can use online reviews to compare the different commercial backpack vacuums to find the best option to meet your needs and work within your budget.